Located between Norumbega Mountain and Cedar Swamp Mountain, Upper Hadlock Pond and Lower Hadlock Pond are two neighboring reservoirs that function as catch basins for all streams flowing down from the peaks southwest of Sargent Mountain. People driving south on Route 198 to Northeast Harbor and Asticou Gardens can see Upper Hadlock Pond just east of the road with the majestic Bald Peak and Parkman Mountains in the background. Both ponds are public water supplies, so no swimming or wading is allowed, but trails around the ponds make for pleasant hiking in some idyllic scenery. 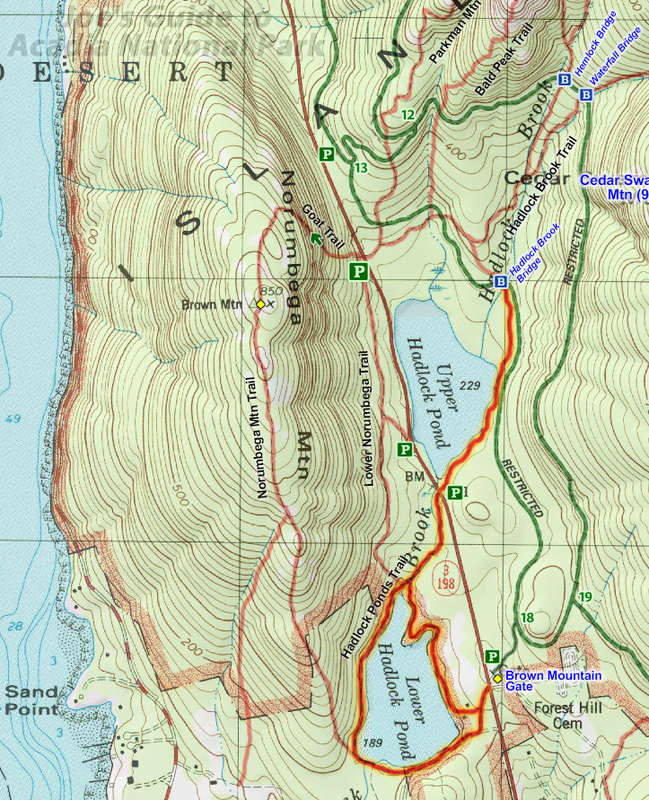 Like just about all hikes in Acadia, there is no one correct route, but a good starting point for a Hadlock Ponds hike is the Brown Mountain Gate. The Brown Mountain Gatehouse parking area is located along Route 198, less than one mile south of Upper Hadlock Pond and roughly half a mile north of the junction with Route 3 at Asticou Gardens; the gate structure is one of the majestic carriage road constructions. From the parking area, cross the road and walk south for a bit to pick up the trail around Lower Hadlock Pond. The Hadlock Pond Road heads clockwise around the pond and takes you to the outlet dam near the junction with the Norumbega Mountain Trail. The Lower Hadlock Trail heads counter-clockwise to join up with the main Hadlock Ponds Trail. Either way offers pleasant scenery and the trail junction on the north end of the pond has some interesting wooden bridge constructions. Once on the main Hadlock Ponds Trail, head north as the trail wanders through some beautiful grassy forested scenery along Hadlock Brook. 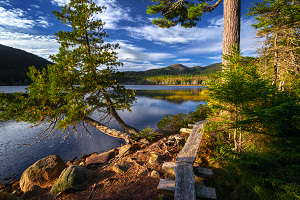 The trail crosses Route 198 and then follows the eastern shores of Upper Hadlock Pond; here the scenery is even more beautiful with Norumbega Mountain and the other neighboring peaks standing tall in the distance. After leaving the pond, the trail ends at the Hadlock Brook Bridge, one of the more modest but elegant carriage road bridges that was built in 1926. 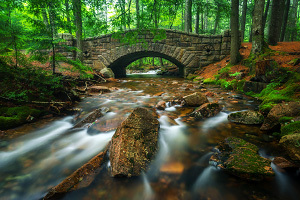 At this point, you could return the way you came, hike the carriage road back to the Brown Mountain Gatehouse parking area, or continue north along the Hadlock Brook Trail for a longer adventure into the beautiful nearby peaks. While I'm admittedly not the biggest fan of lakeside strolls, this is a pleasant little hike, especially the stretch of trail along Upper Hadlock Pond in the late afternoon when the lighting makes the scenery glow beautifully. The only downside to this hike is being so close to the road, the sound of passing vehicles prevents you from getting that wilderness feeling.